When influenza virus is introduced into the respiratory tract, by aerosol or by contact with saliva or other respiratory secretions from an infected individual, it attaches to and replicates in epithelial cells. The virus replicates in cells of both the upper and lower respiratory tract. Viral replication combined with the immune response to infection (which we’ll discuss in later posts) lead to destruction and loss of cells lining the respiratory tract. As infection subsides, the epithelium is regenerated, a process that can take up to a month. Cough and weakness may persist for up to 2 weeks after infection. Volunteers were infected with influenza virus by intranasal instillation, and virus titers were determined in daily nasal washes. Symptoms monitored included nasal stuffiness, runny nose, sore throat, sneezing, hoarseness, ear pressure, earache, cough, breathing difficulty, chest discomfort, and fever. 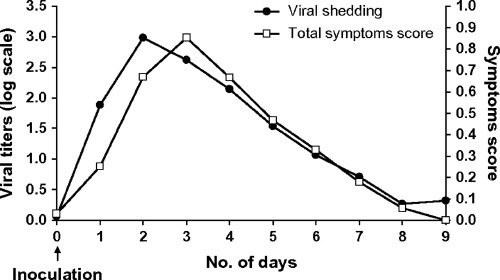 The results indicate that viral shedding precedes illness by one day, but the curves are otherwise very similar. Most infections are mild and complete in 5 days but some continued for a week. Interestingly, 1 in 3 volunteers did not develop clinical illness but nevertheless shed virus. These experimental findings most likely do not completely duplicate what occurs in natural influenza infections. First, the study did not involve children or older individuals, in whom the disease course is likely to be different. Furthermore, the pattern of infection will vary depending on the strain of influenza and the immunological status of the host. Influenza complications of the upper and lower respiratory tract are common. These include otitis media, sinusitis, bronchitis, and croup. Pneumonia is among the more severe complications of influenza infection, an event most frequently observed in children or adults. In primary viral pneumonia, the virus replicates in alveolar epithelial cells, leading to rupture of walls of alveoli and bronchioles. Influenza H5N1 viruses frequently cause primary viral pneumonia characterized by diffuse alveolar damage and interstitial fibrosis. Primary viral pneumonia occurs mostly in individuals at high risk for influenza complications (e.g. elderly patients) but a quarter of the cases occur in those not at risk, including pregnant women. Combined viral-bacterial pneumonia is common. In secondary bacterial pneumonia, the patient appears to be recovering from uncomplicated influenza but then develops shaking chills, pleuritic chest pain, and coughs up bloody or purulent sputum. Often influenza virus can no longer be isolated from such cases. The most common bacteria causing influenza associated pneumonia are Streptococcus pneumoniae, Staphylococcus aureus, and Hemophilus influenzae. These cases can be treated with antibiotics but the case fatality rate is still about 7%. Secondary bacterial pneumonia was a major cause of death during the 1918-19 influenza pandemic, during which antibiotics were not available. The reasons why influenza virus infections may lead to pneumonia are not understood. Several hypotheses have been proposed and disproved over the years, including one in which reduced numbers of lymphocytes allow increased susceptibility to superinfection. I suffered from pneumonia 2months back.had taken antibiotics for 15days,weakness remained for 1month.Full recovery took a long time.In viral infection,one must take sufficient rest to get recovered fastly. I agree with the author about his comment on the paper. However, the reasons why influenza virus infections may lead to viral pneumonia and ARDS are not understood and I would like to know what are the several hypotheses that have been proposed and disproved over the years. My hypothesis is that could it be due to a heavy inoculum infectious dose that are inhaled and deposit directly into the alveoli and cuase severe alveolar damage very soon.